The 500 Club is in its second year, aiming to raise funds solely for the playing budget, to be spent during the January transfer window either on new players or extensions of contracts for existing stars. 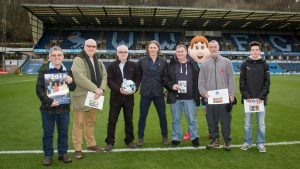 Having raised almost £27,000 already this season, from 167 contributors, the initiative runs regular draws, giving supporters the opportunity to benefit from exclusive invitations, signed merchandise and more. There’ll be 12 draws in the lead-up to Christmas so do sign up to the 500 Club-18 via 500wanderers.co.uk to be entered into each draw. Fans can either pay a one-off fee of £150, or spread the cost of 12 monthly instalments of £12.50. Picture above (thanks to WWFC and whoever took it) shows the first few winners receiving their prizes from Gareth.